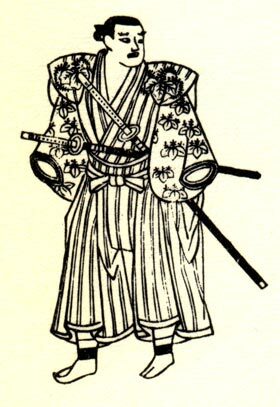 1640s: son of the dôkegata Saitô Yogorô. He started performing under the name of Araki Yojibê I at an early age as a koyaku. 1648~1651: he opened a theater, the "ancestor" of the Kado no Shibai, in the district of the Dôtonbori and became zamoto in Ôsaka. Thanks to Yojibê's efforts, this district became the theatre district of Ôsaka. 1664: Yojibê played in the first play divided into several acts of Kabuki history, which was staged in Ôsaka. The author of the drama was Fukui Yagozaemon and the title was "Hinin no Adauchi". It narrated the tribulations of a young man who had to disguise himself as a beggar in order to look for the murderer of his father. Yojibê's others stage partners were Nakagawa Kinnojô and Kaneko Rokuemon. 1679: Yojibê produced in Ôsaka the drama "Yûgiri Isshûki", which commemorated the 1st anniversary (2nd memorial service) of Yûgiri, who was the most famous courtesan in the Shinmachi pleasure quarter in Ôsaka and who died the 6th day of the 1st lunar month of 1678 . 17th day of the 5th lunar month of 1683: the courtesan Yamatoya Ichinojô and her lover Goze no Chôemon committed suicide together in Ôsaka. This event caused quite a stir and three Ôsaka theaters decided to capitalize on the situation by simultaneously producing the first shinjûmono of Kabuki history [more details]. Yojibê produced this shinjûmono, starring the actors Yoshikawa Tamon I and Nakagawa Kinnojô in the roles of the courtesan and her lover. 11th lunar month of 1686: Yojibê became zamoto for the nadai Ôsaka Tazaemon in Ôsaka. His actors were Yamashita Hanzaemon I, Iwai Hanshirô I, Yamamura Kanzaburô, Sakurayama Rinnosuke I, Sodeoka Masanosuke II, Sakata Tôkurô, Takenaka Hanzaburô, Matsushima Han'ya II, Kozakura Kodayû, Takigawa Kiyosaburô, Yoshikawa Genzaburô, Mihara Jûdayû I, Wakabayashi Shiroemon and Sadoshima Denpachi. 1st lunar month of 1687: Yojibê's rank in "Yarô Tachiyaku Butai Ôkagami", the first hyôbanki in Kabuki history, was jô (superior). He shared this ranking with Yamashita Hanzaemon I, Uemura Kichiya II, Takeshima Kôzaemon I, Suzuki Heizaemon I, Nakamura Kazuma I, Takenaka Kichisaburô, Fujita Koheiji I and Karamatsu Kasen. 1689: Yojibê produced in Ôsaka the drama "Keisei Sayo no Nakayama"; the leading role of the courtesan was played by Tanishima Mondo. It included the first dance in Kabuki history related to the famous mugen no kane theme. 1690: Yojibê produced in Ôsaka the drama "Yûgiri Jûsankaiki", which commemorated the 12th anniversary (13th memorial service) of the courtesan Yûgiri; the roles of Yûgiri and her lover Fujiya Izaemon were played by Tanishima Mondo and Sakata Tôjûrô I. 1691: Yojibê went to Kyôto; he played the role of Kumagai Jirô Naozane in the drama "Ichi-no-Tani Sakaotoshi", which was produced by Yamatoya Jinbê II. 1693: Yojibê went to Edo. 1st lunar month of 1694: Yojibê's rank in the Edo hyôbanki, tachiyaku section (budôgoto subsection), was jô-jô-kichi (superior - superior - excellent). 11th lunar month of 1697: Yojibê produced in Ôsaka the kaomise drama "Yamato no Kuni Chigo no Monju", which welcomed in Ôsaka the Edo actor Saruwaka Sanzaemon I; Yojibê's others stage partners were Onoyama Ujiemon, Kanazawa Goheiji, Takioka Hikoemon, Kamogawa Noshio I, Hattori Jiroemon, Dekishima Kosaburô and Kawakami Saburozaemon. 3rd lunar month of 1698: Yojibê produced in Ôsaka the drama "Taema Chûjôhime Mandara no Yurai", in which he played the role of Kume no Hachirô. 1st lunar month of 1699: Yojibê coproduced with Kataoka Nizaemon I in Ôsaka the drama "Taema Chûjôhime Nidaiki", in which he played the role of Kume no Hachirô. 1st lunar month of 1700: Yojibê produced in Ôsaka the new year drama "Onna Chôteki Sangoku Denraiki", in which he played the role of Hada no Kawakatsu; his stage partners were Sodesaki Karyû, Asao Jûjirô, Sugiyama Heihachi, Murayama Heijûrô I, Sugiyama Kantarô and Bandô Matagorô. 16th day of the 12th lunar month of 1700 : Yojibê died in Ôsaka. Araki Yojibê I was an important figure of the Kabuki world during the second half of the 17th century. He was a successful zamoto and a talented tachiyaku actor, excelling in budôgoto and teoigoto. The 16th day of the 12th lunar month of the 13th year of the Genroku era was the 24th of January 1701 in the western calendar. The 6th day of the 1st lunar month of the 6th year of the Enpô era was the 26th of February 1678 in the western calendar.